Annual Lecture – Renewable Gas: The lowest cost pathway to decarbonising heat? 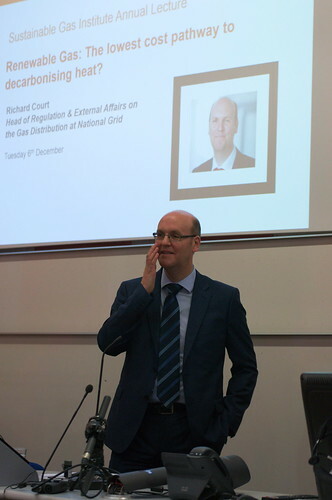 We welcomed Richard Court (Head of Regulation & External Affairs on the Gas Distribution at National Grid) last week for the Sustainable Gas Institute‘s Annual Lecture. SLIDES – Renewable Gas: The lowest cost pathway to decarbonising heat? To achieve the UK’s 2050 decarbonisation targets, a step change in the trajectory of heat decarbonisation will need to occur. Decarbonising heat is challenging, as it potentially requires changes to consumer behaviour and domestic heating systems. Identifying a low cost route to heat decarbonisation, with minimal consumer impact, remains the holy grail of domestic heat policy. Increasingly, the focus is returning to gas as a backbone of this transition. This lecture will explore the nature of the challenge, the technologies available, the stakeholder engagement requirements and a roadmap to delivery. As Head of Regulation & External Affairs on the Gas Distribution Executive team, Richard responsibilities bring together a number of external facing activities such as the regulatory strategy, framework development and reporting, industry development, internal and external communications, stakeholder and customer strategy, public affairs, transportation pricing and commercial policy including entry and exit connections. This involves developing relationships with a wide range of stakeholders inside and outside of the business to enable great outcomes for customers, stakeholders, employees and investors. In recent times, this has involved significant work in looking at the role the gas networks can play in the pathway to decarbonised heat and transport. Prior to joining the Gas Distribution business, Richard held a number of senior management roles in the commercial side of National Grid’s transmission business encompassing both the gas and electricity networks and running the commercial operations of the LNG Storage business. This involved a number of industries wide change projects such as the creation of New and GB Electricity Trading Arrangements and gas network sales. Richard is also a Director of Xoserve Ltd and has previously been a Director of National Grid Affordable Warmth Solutions Limited. Richard was also a key part of the team which developed the regulatory framework, output commitments, and innovation strategy and business plan for the 8 year RIIO Price Control.